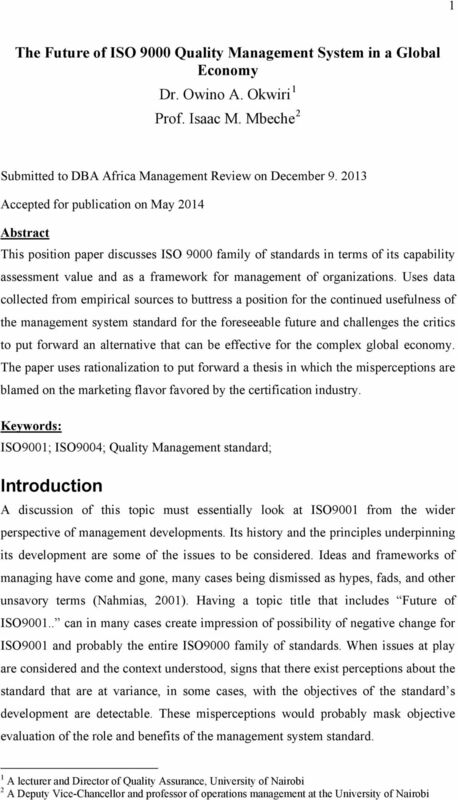 Download "The Future of ISO 9000 Quality Management System in a Global Economy Dr. Owino A. Okwiri 1 Prof. Isaac M. Mbeche 2"
3 3 not a requirement of the standard. This essentially points to a position that the future of the standard and the future of certification are distinct. Two reports relating to the same concern amplifies the need for clarity on this topic. A special report in Fast Forward, a publication by ISO Central Secretariat (International Organization for Standardization, 2009) has the title The future of certification. 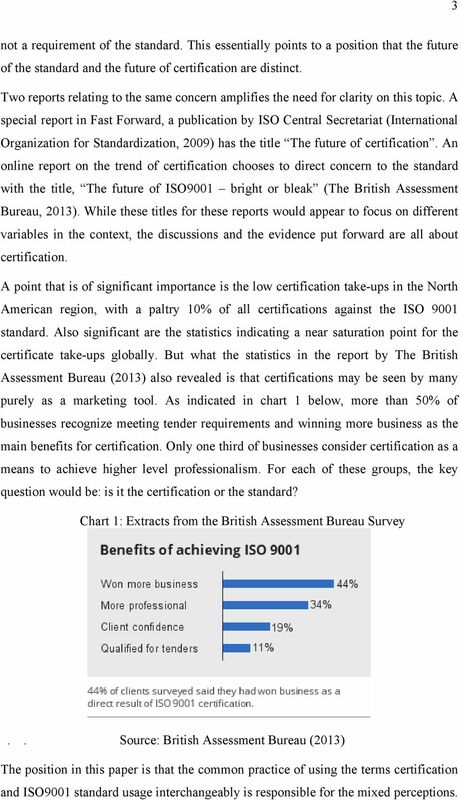 An online report on the trend of certification chooses to direct concern to the standard with the title, The future of ISO9001 bright or bleak (The British Assessment Bureau, 2013). While these titles for these reports would appear to focus on different variables in the context, the discussions and the evidence put forward are all about certification. A point that is of significant importance is the low certification take-ups in the North American region, with a paltry 10% of all certifications against the ISO 9001 standard. Also significant are the statistics indicating a near saturation point for the certificate take-ups globally. But what the statistics in the report by The British Assessment Bureau (2013) also revealed is that certifications may be seen by many purely as a marketing tool. As indicated in chart 1 below, more than 50% of businesses recognize meeting tender requirements and winning more business as the main benefits for certification. Only one third of businesses consider certification as a means to achieve higher level professionalism. For each of these groups, the key question would be: is it the certification or the standard? Chart 1: Extracts from the British Assessment Bureau Survey.. 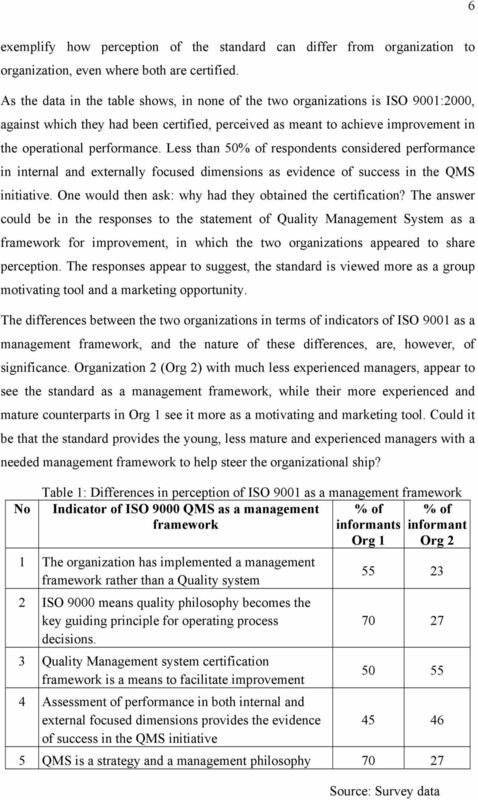 Source: British Assessment Bureau (2013) The position in this paper is that the common practice of using the terms certification and ISO9001 standard usage interchangeably is responsible for the mixed perceptions. 4 4 The standard s purpose remains and this, right from its origin as a United States military standard, Mil-Q-9858A, is to assure capability of the organization beyond a single consignment of products. Organizations could make big savings from the expenses they incur in developing supplier evaluation systems, by utilizing the management system standard as the evaluation criteria. The standard s effectiveness has been proven, if not through the longevity of the structure but through its take up by the leading contract spenders in the world. 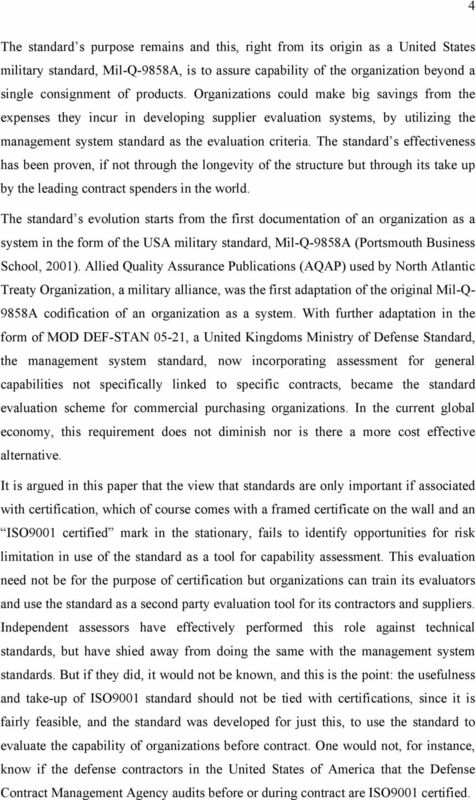 The standard s evolution starts from the first documentation of an organization as a system in the form of the USA military standard, Mil-Q-9858A (Portsmouth Business School, 2001). Allied Quality Assurance Publications (AQAP) used by North Atlantic Treaty Organization, a military alliance, was the first adaptation of the original Mil-Q- 9858A codification of an organization as a system. With further adaptation in the form of MOD DEF-STAN 05-21, a United Kingdoms Ministry of Defense Standard, the management system standard, now incorporating assessment for general capabilities not specifically linked to specific contracts, became the standard evaluation scheme for commercial purchasing organizations. In the current global economy, this requirement does not diminish nor is there a more cost effective alternative. 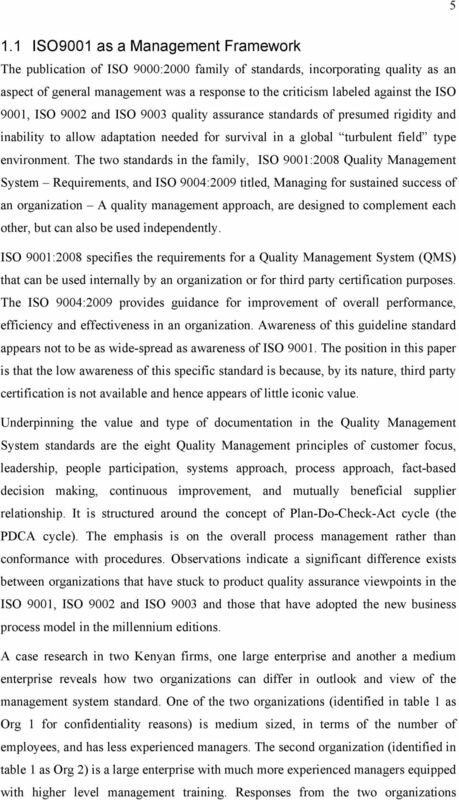 It is argued in this paper that the view that standards are only important if associated with certification, which of course comes with a framed certificate on the wall and an ISO9001 certified mark in the stationary, fails to identify opportunities for risk limitation in use of the standard as a tool for capability assessment. 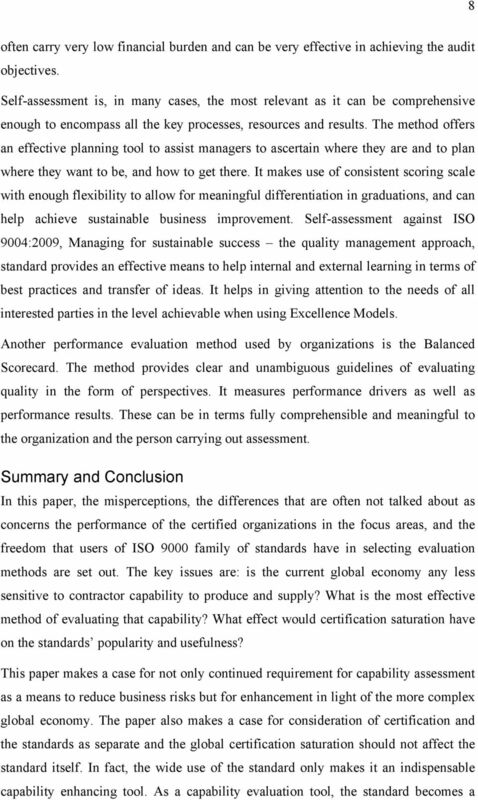 This evaluation need not be for the purpose of certification but organizations can train its evaluators and use the standard as a second party evaluation tool for its contractors and suppliers. Independent assessors have effectively performed this role against technical standards, but have shied away from doing the same with the management system standards. 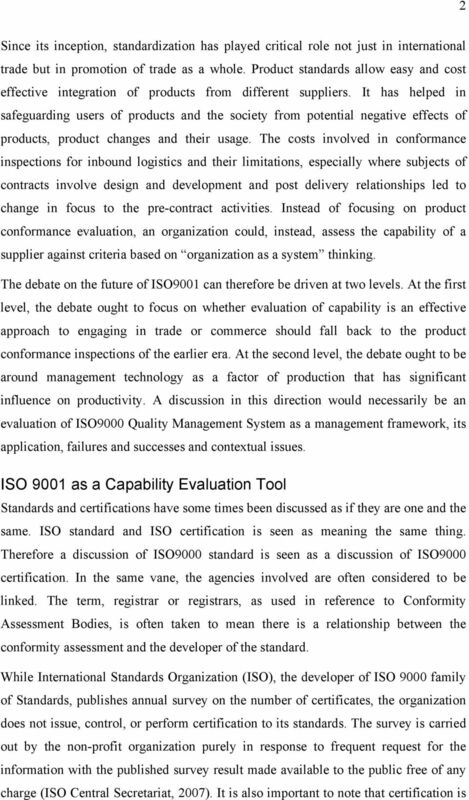 But if they did, it would not be known, and this is the point: the usefulness and take-up of ISO9001 standard should not be tied with certifications, since it is fairly feasible, and the standard was developed for just this, to use the standard to evaluate the capability of organizations before contract. One would not, for instance, know if the defense contractors in the United States of America that the Defense Contract Management Agency audits before or during contract are ISO9001 certified. 9 9 contract order qualifier even if not an order winner. In this respect, the future of the standard, if not the certification, is bright. What is not desirable as it blurs the benefits of the standard is the certification-driven use of the standard. This position has been supported by empirical evidence which suggests it could be responsible for the mixed customer satisfaction outcomes associated with the quality management system standards in some cases. A point that must be stressed is that audit as applied by conformance assessment bodies is not the only evaluation method for quality systems. Nor is it the only audit type. A conclusion that can be drawn from the analysis in this paper is that the standard provides organizations with invaluable means for minimizing contract risks. Beyond this, the standard is an important embodiment of the key aspects of management technology and is effective in enhancing strategic capability for organizations. In this respect, ISO 9001 is invaluable but its use must be driven by the users capability needs not market needs of assessment industry. References British Assessment Bureau (2013). 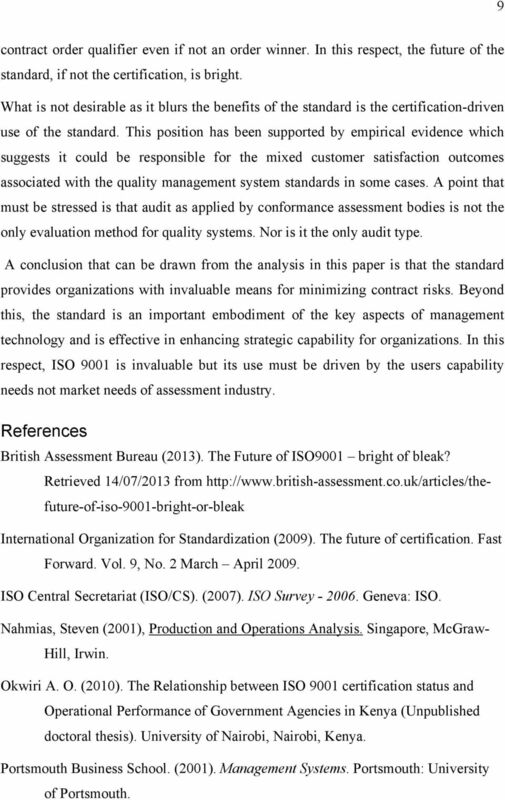 The Future of ISO9001 bright of bleak? 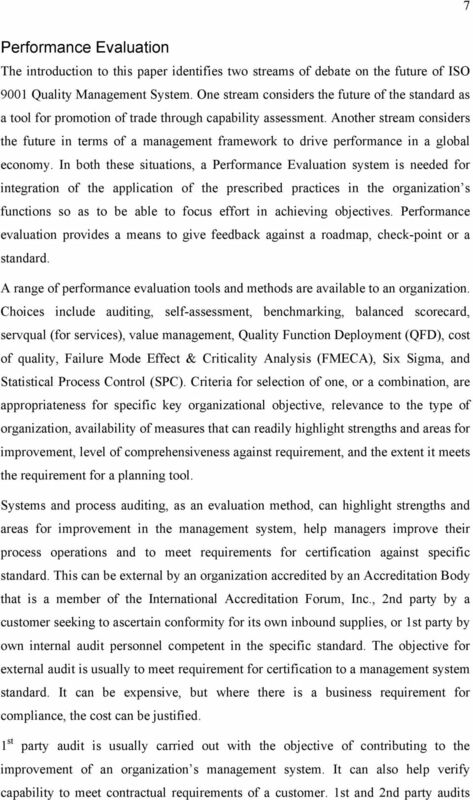 Retrieved 14/07/2013 from International Organization for Standardization (2009). The future of certification. Fast Forward. Vol. 9, No. 2 March April ISO Central Secretariat (ISO/CS). (2007). ISO Survey Geneva: ISO. Nahmias, Steven (2001), Production and Operations Analysis. Singapore, McGraw- Hill, Irwin. Okwiri A. O. (2010). The Relationship between ISO 9001 certification status and Operational Performance of Government Agencies in Kenya (Unpublished doctoral thesis). University of Nairobi, Nairobi, Kenya. Portsmouth Business School. (2001). Management Systems. Portsmouth: University of Portsmouth. THE QUALITY MANAGEMENT SYSTEM IS YOURS UP TO STANDARD? The Development of a Quality Management System for a Service and Manufacturing Organization. The President of Inductors Inc. is the senior executive responsible for operations. What are the advantages and limitations of different quality and safety tools for health care?